So welcome back everyone! Here we are with our second week of comic reviews for the year! After last weeks chock full week of several comics this time we are pretty slow with only one comic to review which comes to us from the awesome people at Vibranium Comics and Games in Ocala Florida. Vibranium is an awesome little store where everyone gets to know everyone. They have a nice gaming area in the back and are always having some sort of event for games or trivia or even movie nights. So be sure to check them out by clicking the banner below! So I was kinda excited about the comic they gave me to review this week. You see I a huge fan of all things Joss Whedon from Buffy to Firefly and even Doll House I have so far loved everything he has done. So this week I ended up having Buffy the Vampire Slayer #1 handed to me. 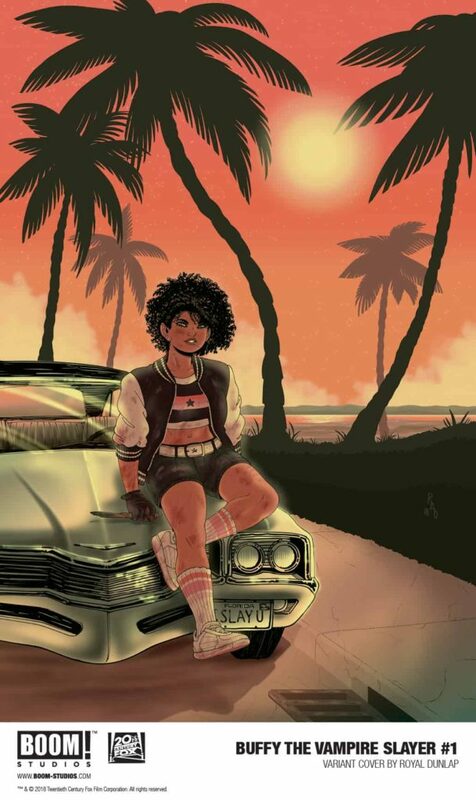 The odd thing is that the cover says Miami 1979 and has a cute black girl leaning against the hood of a car on it. Now in some ways, this made sense to me because I had heard rumors that they were going to reboot the Buffy TV show with a black girl staring as Buffy this time. However, when you read this comic the cover has absolutely not a thing to do with the comic at all! So yeah that kinda confused me right off the bat. Now this is indeed a reboot of Buffy in comic form. However, it has all the characters you would expect if you have ever watched the old TV show with Sarah Michelle Gellar starring as Buffy. In fact, very swiftly in the book you see the blonde Buffy we all know and love and we get introduced to Zander and Willow who get rescued at the last moment from being eaten by a Vampire by our main character. Now judging by the cell phones and such in use as well as a few other things in the comic we can also assume this takes place present day and we also find out that t takes place in the same town as in the tv show and about a week after Buffy has started school there. Though even a week after starting school there a vampire lets it be known in the first few pages that rumors are already going around that the slayer works at the local fast food fish joint. The comic also references Wolfram and Hart (which you will recognize from Angel if you’ve watched that) and it also shows a witch watching Firefly on tv, two cool little easter eggs I thought! So Zander seems the same as what I remember from the show, Willow, on the other hand, seems to be a Lesbian now. Granted I don’t know if she ever came out in the old show as I didn’t see all of it but the parts I remember had her wanting to date guys so this for me is a change. However, nothing much else has changed and it seems like a pretty faithful reboot of Buffy. I’m curious where they will be going with this one since it seems to just be a reboot of what we already know without changing the characters or place or anything all that much. To me, this is odd since usually a reboot will have a new backstory or new types of people playing the characters or at least some big change but this doesn’t seem to be all that far off of what I remember the old show being. So, all in all, I would say if you liked the old comics or the old show go ahead and give this one a try. I think you would like it if you’re a Buffy fan. If you’ve never tried Buffy before this might be a good place to jump into things at least comic wise. Let me know in the comments below if you picked this up and what you think of it and where you think they may go with this series! Do you like the idea of a reboot being so close to the original or would you rather see more changes? Also, what do you think is up with the odd cover? Remember if you like what we do here and want to support us you can check out Ko-fi.com/thalra and drop us a tip or if you want to purchase some cool geek shirts and items we hope to be working on getting a new online store going soon! My favorite part of Buffy was after high school and college when Willow develops her power when you find out that Buffy sister is the key and Spike starts turns into good. The upcoming Buffy reboot should take a look at this for inspiration, it did a good job at modernizing the original characters. Great review. I did read most of the Dark horse run of Buffy, and plan to read this one too.? What! I honestly didn’t know Buffy the Vampire Slayer had a comic. I only imagined it to be a stand alone show, not that I was able to follow through the whole show but I did see some episodes! You might be right in the fact that this might be something interesting to jump into comic wise. Also, the cover looks kind of odd to me!!!! But perhaps I’ll understand it better if I at least check the comic out.